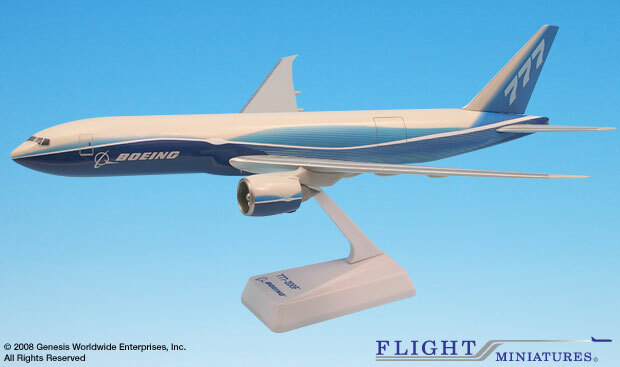 Flight Miniatures 1:200 Scale Plastic Snap-Fit – Boeing 777-200 – Length:12.5" Wingspan: 12.75"
This model represents the Boeing 777-200 Freighter in the standard Boeing Demo livery. Boeing introduced this livery design, which is used for marketing activities, in 2004. The 777-200F will have a revenue payload capacity of 229,00 pounds (104 metric tons) and a range of 4,885 nautical miles (9,045 km) with a full payload, making it the world’s longest range twin-engine freighter.